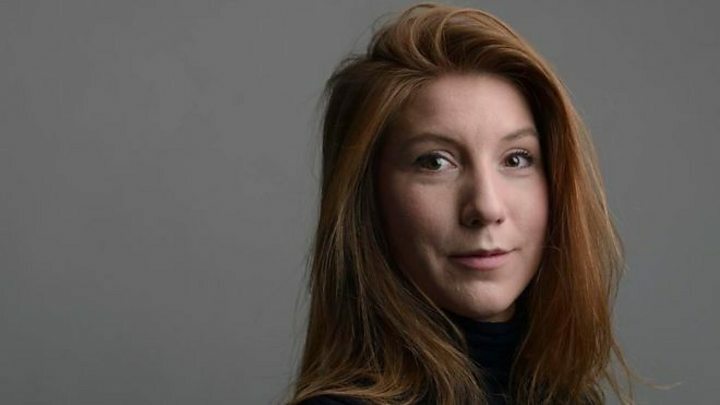 A headless torso found in waters off Denmark has been identified as missing Swedish journalist Kim Wall, Danish police say. DNA from the torso matched that from Ms Wall's hairbrush and toothbrush. Chief investigator Jens Moller Jensen said that the torso had been weighted down with metal in an apparent attempt to stop it floating. Ms Wall was last seen alive on 10 August as she departed on a submarine trip with inventor Peter Madsen. The submarine sank hours after the search for Ms Wall began, after her partner reported that she had not returned from the trip. Mr Madsen, who designed and built the submarine, was charged with negligent manslaughter and is in detention. He initially said he had dropped her off safely near Copenhagen, but has since said she died in an accident and that he had "buried" her at sea. Danish police believe the 40-tonne submarine was deliberately sunk by Mr Madsen. Traces of blood have been found inside the submarine, and they also match Ms Wall. The remains were found on a beach south of Copenhagen on Monday. Mr Jensen would not comment on the cause of death but said forensic investigations were still being carried out and police were looking for the rest of her body. As well as the metal attached to the torso, Mr Jensen said the remains were mutilated in what appeared to be an attempt to ensure that decomposition gases passed out of the body, to make it less likely to float. "During the horrendous days since Kim disappeared, we have received countless examples of how loved and appreciated she was, as a person and as a friend, as well as a professional journalist," Ingrid Wall said in a family statement released on Facebook. "From all corners of the world we have received testimony to how she was able to be a person who made a difference." Ms Wall, 30, was reported missing by her boyfriend in the early hours of 11 August, after she failed to return from the trip on Peter Madsen's homemade submarine, the Nautilus. A freelance journalist who had written for the Guardian, New York Times and South China Morning Post, she is said to have been researching a feature about the inventor and the Nautilus, which he built in 2008 with crowdfunding. Emergency services scoured the area of sea to the east of Copenhagen and the submarine was eventually spotted from a lighthouse south of the Oresund bridge between Denmark and Sweden. Within 30 minutes, the vessel had sunk and Mr Madsen had to be rescued. For 10 days, the search for the journalist continued. A torso was found by a passing cyclist on a beach near Koge Bay on Monday. Police said the next day that the arms, legs and head had been deliberately cut off. They finally confirmed it was Kim Wall in a tweet early on Wednesday. Mr Madsen's lawyer, Betina Hald Engmark, said the news that the torso was Ms Wall did not change her client's position, that the journalist had died in an accident. He was "very relieved" the torso had been identified, she told Danish media. "He wants nothing else than for this case to be cleared up." Peter Madsen pleaded not guilty in a closed-door judicial hearing earlier this month. Copenhagen police are re-examining old cases, as is standard in such investigations, according to the chief prosecutor, including the death of a 22-year-old Japanese woman, whose torso was found in Copenhagen harbour in 1986. That case has never been solved.